I am such a girl, and I love it. I love clothes, shoes, jewelry and shopping. Been a great week for all. Running has become such a part of who I am, that even my need for a retail therapy pick me up centers around it. This last week was long and draining. Doctor and family visits, no one gets away from that whole. So I needed a little retail boost. I found a Brooks Outlet store in Seattle, my first time in a running store. I was able to pick up a bra and skirt for a price that didn’t put too much of a dent in my pocket book. Love clearance racks. 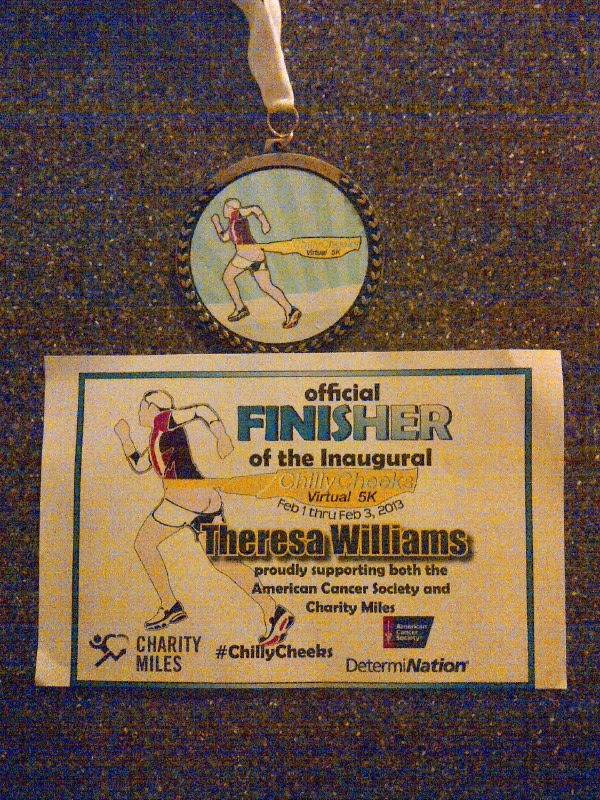 Today I got my Chilly Cheeks finisher medal in the mail. I love my new bling, super cool. I wonder if it goes with a skirt and go go boots? I think I might need a medal hangar soon. That will need to wait for another therapy day. Life is good as a Sister Runner.